Whether you observe the religious significance of the Easter holiday, or have little ones who are excited at the prospect of tearing round the garden and hunting for eggs, Easter is a time for friends and family. Visiting seniors at Easter is a great way to bring some love and warmth into their lives – and yours! This comfort and happiness, sharing the holiday together is a great way to make this Easter memorable for those that you really care about. 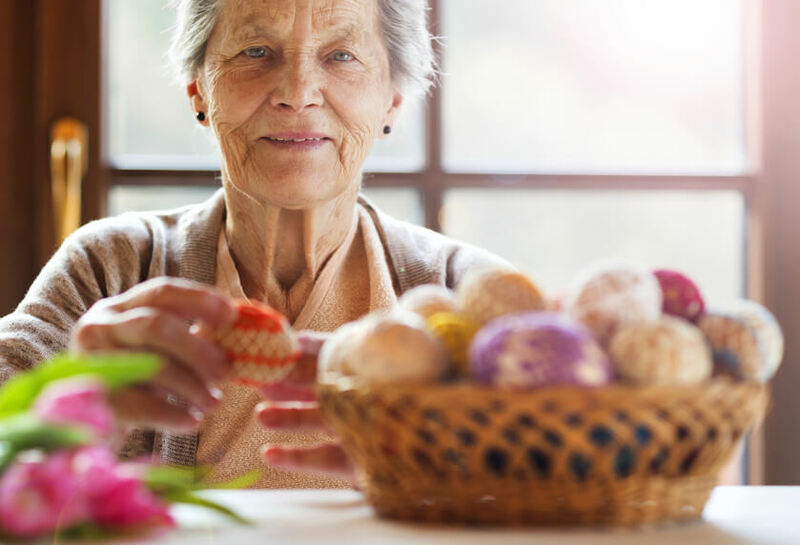 As one of the most caring residential and nursing care homes in Manchester, Flixton Manor always endeavours to put a smile on our residents faces every holiday – and this Easter is no different. For Easter 2019, Flixton Manor Care Home will be hosting a day filled with Easter festivities. We’d like to invite everyone to come along and join in the fun. Spend some time with those who would really appreciate it – and make a different to their Easter holiday. There will be a selection of delicious Easter cakes, good company and a cheerful spirit. Easter is, after all, a celebration – so let’s all celebrate it together. In addition to a selection of sweet treats, we’ve organised an Easter bonnet raffle where lucky ticket holders will be in with the chance of winning prizes galore! Along with the fun Easter activities we have planned, Flixton Manor Home would gratefully accept any donations. Your gift could make a real difference – and be that one something that one of our residents cherishes and remembers, not only this Easter but, throughout the summer and beyond. So, if you can think of something that would put the icing on the cake, giving seniors a reason to think fondly of their Easter this year, don’t hesitate to get in touch. As a skilled nursing facility, Flixton Manor Care Home will make sure that residents are well-cared for throughout the duration of the festivities. Our highly-trained staff place resident care and happiness above all else. Throughout our entire Easter celebration, the exemplary levels of care that patients deserve will be observed. In addition to our Easter celebrations, we’ve a wealth of upcoming spring and summer activities that we’re confident our residents will enjoy. From arts and crafts to getting outside and basking in spring’s wonderfully inviting nature, we know how to bring seasonal spring delights to those in our care. Why not come and ask us what we’ve got planned this spring? After all, spring is the season of renewal. The time of year when new life leaps and bounds all around us. What better time of year to enquire at our skilled nursing facility and learn how we intend to bring warmth, colour and life into their lives in the coming months! Flixton Manor is a one of the foremost care home homes in Manchester. We have more than 25 years’ experience improving the quality of life of our residents. Learn more about our Easter celebrations, or our residential care home today by calling 0161 746 7175, where one of our friendly staff would be happy to help you.